Last weekend I attended the March For Our Lives. Besides my passion for yoga, I have always been a social activist and a softie for a good cause. When it comes to something I feel passionate about, I try to attend rallies, volunteer or help to raise funds for what I believe in. 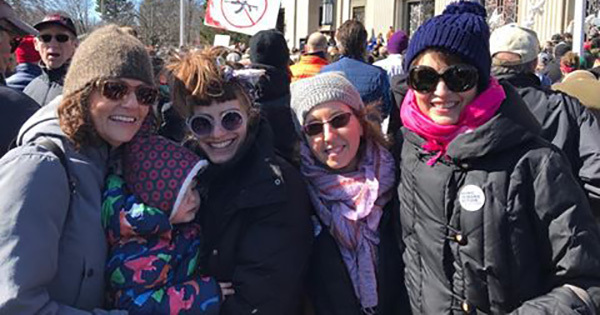 When I arrived at the March, I bumped into several friends from various parts of my life. I saw students from my studio and friends from my neighborhood and my women’s circle. Together, we joined for a common cause and purpose. It was a chilly morning but he sun was shining and the band was playing fantastic music; a formula for a great march and a day of community. I felt a deep bond with my friends and those I was unacquainted with. Kula in Sanskrit means a community of the heart, a group coming together of its own free will. Kula is an intentional community, a spontaneous family. It can also be translated as clan or tribe. It is often used in the yoga community to denote the sense of inclusion that can be cultivated through people coming together to practice yoga (many of you know exactly what I am talking about). For me, Kula goes beyond the yoga studio and the yoga practice. The day of the March, my Kula became every single person at the event and everyone who marched around the world. Every stranger and every person inspired and motivated me. They made me feel hopeful and supported my values. We were all part of a new Kula. If you have ever seen a Venn diagram, you know it can be pictured with several interlocking circles. Imagine each circle is a place you participate, work, family, interests, and recreation. Where the circles meet is an extraordinary place. It’s where two Kulas intersect and can be a place of pleasant surprise. For example, I unexpectedly ran into one of my yoga students at the March For Our Lives. On that morning, two very important communities in my life merged – yoga and social activism. I immediately felt a deeper connection since we both posses a love of yoga and a passion for a similar social cause. Have you every considered the Kula you are a part of? What is the feeling you have when practicing with a group? Whether it’s your workplace, your yoga studio or your passion, participate as though you are part of a family or tribe. Perhaps even set the intention next class to appreciate the love of yoga you share with each person on every mat in the room. If you are reading this, you are part of my Kula and I am grateful for that. Happy Spring!